Long Before Light is the third CD by the Onlies, a three-piece band from Seattle. Sami Braman, Riley Calcagno, and Leo Shannon are still juniors in high school, but have played together for years, so they are a solid band. Together, they have been to many fiddle camps including Valley of the Moon, Sierra Fiddle Camp, Fiddle tunes, Big Sur Fiddle Camp, and Mount Shasta Fiddle Camp and the influence of those camps shows. It is not uncommon to walk around these camps at any time of day or night and hear people jamming and that CD reflects the same laid-black groove that develops from playing in those jams. Their first CD was an eclectic mix of old-time, Irish, Scottish, and Cape Breton and those styles were displayed separately in each tune. Now, they have their own style that incorporates those influences into a cohesive album. The first thing I noticed after the listening to the Onlies’ new CD Long Before Light was how consistent it was, less jumping from an old-time tune to a Martin Hayes tribute. The instrumentation remains traditional, emphasizing banjo, fiddle, guitar, and three-part vocal harmonies. Guest musicians include RuthMabel Boytz (also a junior in Seattle) on bass and their producer Tristan Claridge on cello. Tristan himself is a fiddle camp alumni, but also a 5-time Weiser Grand Champion on fiddle and performs with his own bands, the Bee Eaters and previously Crooked Still. The first and last tunes are particularly influence by the fiddle camp vibe. The first is written by Leo and is called Cheese Closet. The tune starts off with Leo on lead fiddle, Tristan droning on cello, and Sami chopping on back-up fiddle. 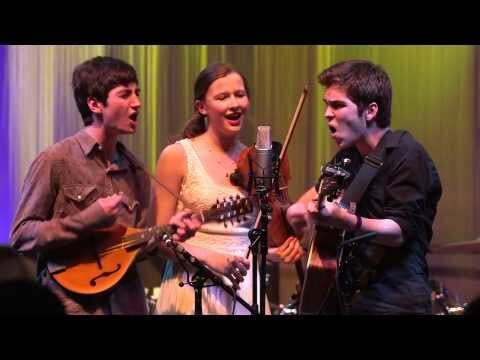 The song really builds when Riley comes in on banjo and a twin fiddle harmony emerges between Leo and Sami. The final tune of the CD is an original by Sami Braman called Big Sur Tune. It features twin fiddles (Sami and Riley), chops on cello (Tristan), and guitar back-up (Leo). Sami wrote this tune while at the Big Sur Fiddle Camp This tune feels spontaneous and really captures the fun of jamming and playing music with friends. I have gone to fiddle camp and jammed with the Onlies, although I have never been to the Big Sur Fiddle Camp. Big Sur Tune makes me wish to be at a camp again, jamming with friends. There are some more traditional songs on the album as well, like Handsome Molly. It is one of my personal favorite songs, although most versions I’ve heard have been played a bit faster than traditional and played in a more bluegrassy way. The Onlies did the opposite of that, and actually slowed the tune down a bit. They also included the octave fiddle (Riley) for a nice drone under the twin fiddles (Sami and Leo) as well as under Leo singing. One of the other traditional songs on the album is Jubilee. The Onlies sing/play Doc Watson and Jean Ritchie’s version. They played this tune at the end of a jam at Big Sur Fiddle Camp, and ended up liking the simplicity of it. One of my favorite songs on the album is an original called Past the Fog.” Written by Leo, this minor melody was inspired by On the Road by Jack Kerouac according to Leo. Leo plays guitar in it, Riley plays mandolin, Sami plays fiddle, and all three sing. It also features RuthMabel on bass. Although the song isn’t very fast, the underlying melody and solos are very energetic and fast. I really love the Onlies and wish they would come to Southern California for some shows. Boulevard Music, McCabes, Coffee Gallery Backstage, Topanga Banjo Fiddle, you should get them on your program!